Centro fidi, access to credit for small and medium enterprises! 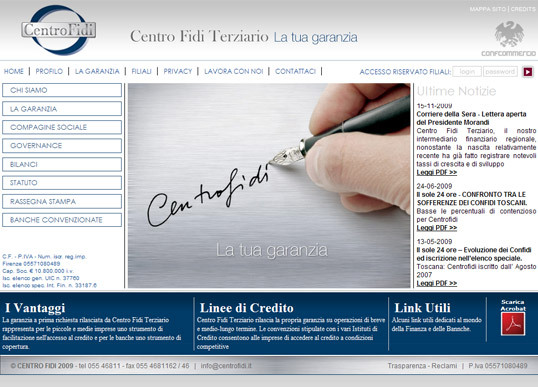 New image, new website and new corporate communications for the Centro Fidi, one of the most important financial companies in the sector on the national stage, came directly from Confcommercio, which caters to the business world, professionals and workers. 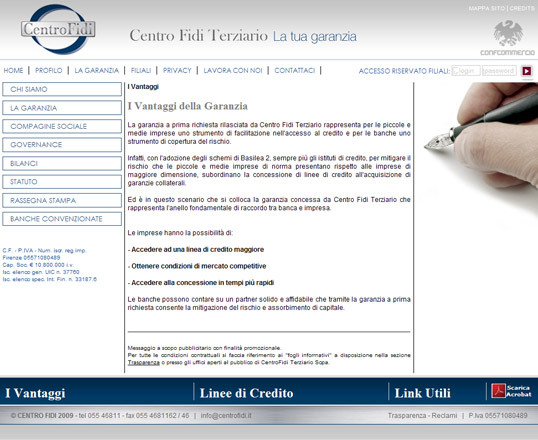 Thanks to its know how the Centro Fidi offers a consultancy and research to the needs of his clients, related to the historical moment, the market laws and regulations in place to provide warranty service that allows easy custom direct access to credit for customers by enabling small and medium-sized enterprises can improve growth prospects. This is due to the release of Warranties and collaboration with major national banks, such as: Banca Monte dei Paschi di Siena, Banca Toscana, BCC, Cariprato, Cassa di Risparmio, Unicredit, Banca Sintesi, Banca Sella, Banca Antonveneta and many other. Posted on 26 July 2011 by admin. This entry was posted in web. Bookmark the permalink.